Aka: swapping out the Motherboard. Note: Storage Encryption is not covered here. Note: Stand-alone controllers are not covered here. Firstly, I need to point out that I’m not a Field Engineer, but I nearly got to do one of these. Long story short-ish, we had issues updating the service processor firmware - it was taking too long to update - and a particular process we were doing needed a takeover/giveback done, and - after doing the takeover - the node with issues rebooted to “Waiting for SP” and would never boot any further. The moral of the story is “always leave updating of service processor firmware to the last task - and be patient with it”. Of course, we’ll never know if there was some issue before the reboot, perhaps the node would have panic-ed after we’d left site, which would have been worse. So, the motherboard needed replacing. Interestingly, the Field Engineer followed a PDF from elsewhere - personally, I would have followed my notes (which are based on the official documentation). For what it’s worth, the system was running ONTAP 8.3.2. - All disk shelves must be working properly. - If your system is in an HA pair, the healthy node must be able to take over the node that is being replaced (the impaired node). Impaired node = node that is being replaced. Replacement node = new node that is replacing the impaired node. Healthy node = surviving node. Note: I skim over this section since the controller was down already. 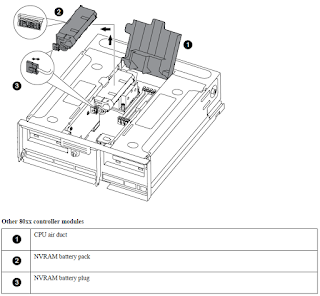 If the NVRAM LED is not flashing, there is no content in the NVRAM. Locate and remove the boot device. connector pins in the boot device. Locate and remove the NVRAM battery. 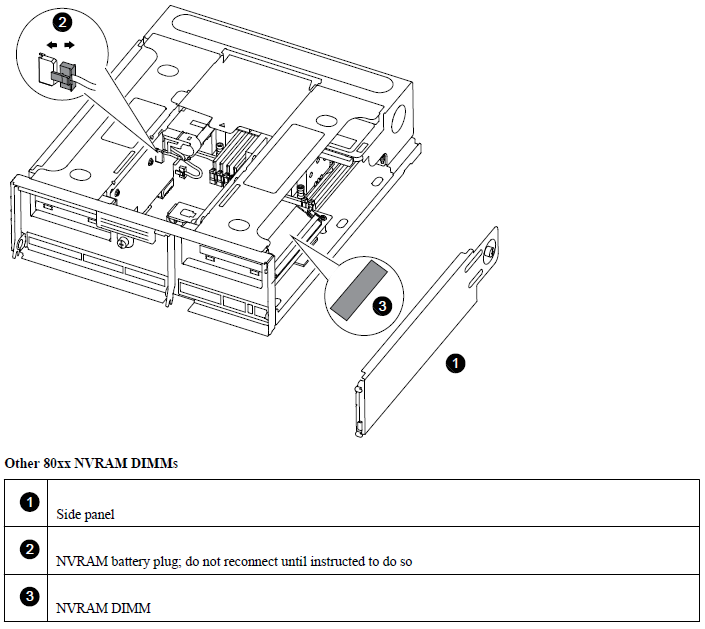 Image: Locate and remove the NVRAM battery. - Open the CPU cover. - In the new controller module, seat the battery in the holder. 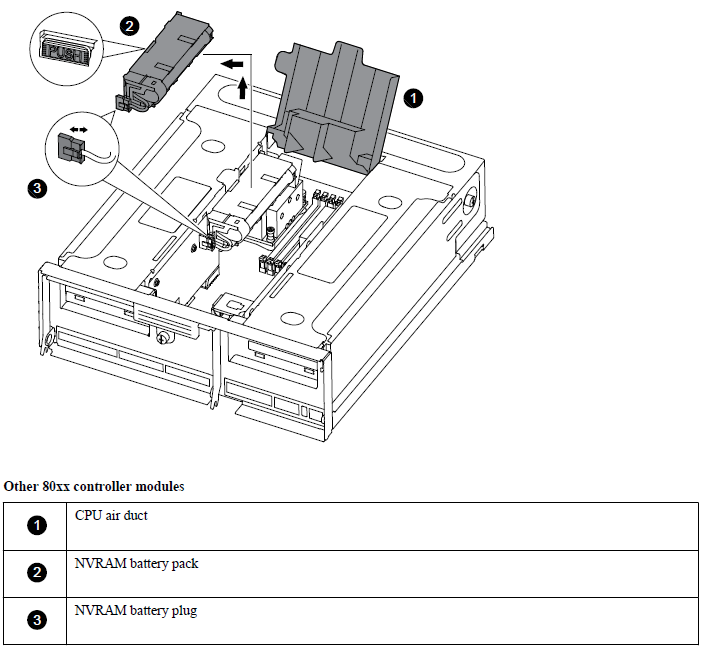 - Open the CPU air duct and locate the NVRAM battery. - Locate the battery plug and squeeze the clip on the face of the battery plug to release the plug from the socket, and then unplug the battery cable from the socket. - Align the tab or tabs on the battery holder with the notches in the new controller module, and gently push down on the battery housing until the battery housing clicks into place. Note: Ensure that you push down squarely on the battery housing. 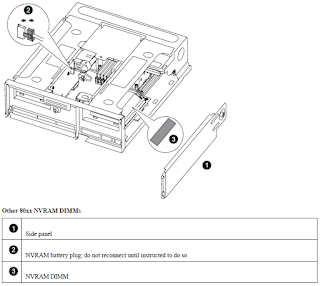 Attention: Do not connect the NVRAM battery plug into the socket until after the NVRAM DIMM has been installed. 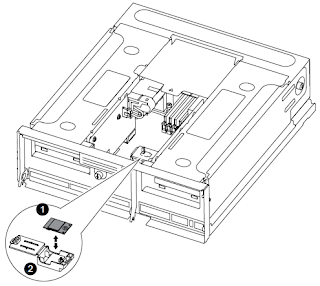 - Leave the CPU air duct open until you have moved the system DIMM. Moving the DIMMs to the new controller module. 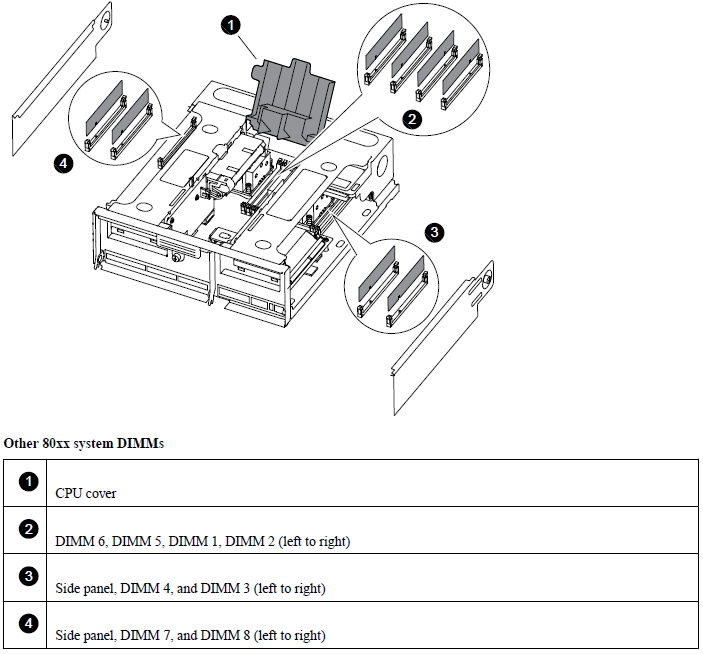 Image: Moving the DIMMs to the new controller module. Attention: NVRAM battery plug, do not reconnect until instructed to do so! Finally, plug the battery back into the controller module. Note: For HA pairs with two controllers in the same chassis, the sequence in which you reinstall the controller module is especially important because it attempts to reboot as soon as you completely seat it in the chassis. The system might update the system firmware when it boots - do not abort this process! 2.3.1: Push the controller module halfway into the system. Note: Do not completely insert the controller module in the chassis! 2.3.2: Re-cable the console port so you can follow the boot process. 2.3.3: Complete the reinstall of the controller module. You can safely respond Y to these prompts. Note: If you made changes above, boot back into maintenance mode to verify the changes. Note: I skim this section. It is recommended to run diags. Wait until “Waiting for giveback...” appears on the replacement node. Note ii: If giveback is vetoed you will need to override vetoes. And perform standard Cluster Health checks! The old controller module will need to be returned to NetApp.